Ruined croft houses on Fuaigh Mòr in Loch Roag. The island was cleared of its inhabitants in 1841 and is now only used for grazing sheep. 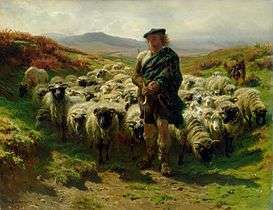 The Highland Clearances (Scottish Gaelic: Fuadach nan Gàidheal, the "eviction of the Gael") was the forced displacement during the 18th and 19th centuries of a significant number of people from traditional land tenancies in the Scottish Highlands, where they had practised small-scale agriculture. It resulted from enclosures of common lands and a change from farming to sheep raising, an agricultural revolution largely carried out by hereditary aristocratic landowners. The Clearances were a complex series of events occurring over more than a hundred years. A Highland Clearance has been defined as "an enforced simultaneous eviction of all families living in a given area such as an entire glen". The Clearances are particularly notorious as a result of the brutality of many evictions at short notice (year-by-year tenants had almost no protection under Scots law), and the abruptness of the change from the traditional clan system, in which reciprocal obligations between the population and their leaders were well recognised. The cumulative effect of the Clearances, and the large-scale "voluntary" emigrations over the same period, devastated the cultural landscape of Scotland in a way that did not happen in other areas of Britain; the effect of the Clearances was to destroy much of the Gaelic culture. The Clearances resulted in significant emigration of Highlanders to the coast, the Scottish Lowlands, and further afield to North America and Australasia. In the early 21st century, many times more descendants of Highlanders are found in these diaspora destinations than in Scotland. The enclosures in rural England in the British Agricultural Revolution started much earlier, during the Tudor period. Similar developments in Scotland have lately been called the Lowland Clearances by historians such as Tom Devine. But in the Highlands, the impact on a Goidelic (Scottish Gaelic)-speaking semi-feudal culture, which had included the fulfilment of obligations of a chief to his clan, led to vocal campaigning against the actions. There has been a lingering bitterness among the descendants of those forced to emigrate or to remain in crofting townships on very small areas of poor farming land. From the late 16th century, laws required clan leaders to appear in Edinburgh regularly to provide bonds for the conduct of anyone in their territory. This created a tendency among chiefs to identify as landlords, rather than leaders of men. The lesser clan-gentry increasingly took up droving, taking cattle along the old unpaved drove roads to sell in the Lowlands. This brought wealth and land ownership within the clan, though the Highlands continued to be overpopulated and poor. The landowners considered the crofters to be virtually free labour, and forced them to work long hours in activities such as harvesting and processing of kelp, an activity that reached its peak in the West Highlands between 1750 and 1815. The Jacobite Risings (1648-1746) brought repeated government efforts to curb those clans who supported James VII of Scotland and II of England and James Francis Edward Stuart and Charles Edward Stuart. The government of the day responded with repression after the 1746 Battle of Culloden, the last major attempt by the Stuarts to reclaim the throne. The 1746 Act of Proscription, incorporating the Dress Act, required all swords to be surrendered to the government; it prohibited the traditional wearing of clan tartans and kilts. The Heritable Jurisdictions (Scotland) Act 1746 removed the virtually sovereign power which the chiefs held over their clans. The government's enforcement of the prohibitions varied and often related to the degree of a clan's support during the rebellion. But, overall these actions led to the destruction of the traditional clan system and of the supportive social structures of small agricultural townships. From about 1725, in the aftermath of the first Jacobite Rising, Highlanders had begun emigrating to the Americas in increasing numbers. Under the Disarming Act of 1746 and the Clan Act of 1715, the Crown made ineffectual attempts to subdue the Scottish Highlands, and eventually sent in troops. Government garrisons were built or extended in the Great Glen at Fort William, Kiliwhimin (later renamed Fort Augustus) and Fort George, Inverness, as well as barracks at Ruthven, Bernera and Inversnaid, linked to the south by the "Wade roads" (constructed for Major-General George Wade). These had the effect of limiting organisational travel and choking off news; and further isolated the clans. But, social conditions remained unsettled for the whole decade. 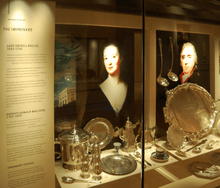 Two improvers and their possessions: Lady Grisell Baillie (1665-1744) and Sheriff Donald MacLeod (1745-1834). What became known as the Clearances were regarded by the landlords as necessary improvements to make agriculture viable. They are thought to have been begun by Admiral John Ross of Balnagowan Castle in 1762. MacLeod of MacLeod (the chief of Clan MacLeod) began experimental work on Skye in 1732. Chiefs hired Lowland, or sometimes English, factors with expertise in more profitable sheep farming. They "encouraged", sometimes forcibly, the population to move off land judged suitable for raising sheep. To landlords, "improvement" and "clearance" did not initially mean depopulation. At least until the 1820s, when the price of kelp had steep falls, landlords wanted to create pools of cheap or virtually free labour, supplied by families subsisting in new crofting townships. Having the crofters collect and process kelp yielded profits to the landlords, and they petitioned successfully for legislation designed to stop emigration, leading to the Passenger Vessels Act 1803. 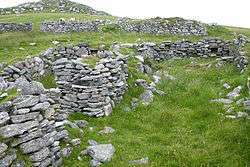 Attitudes changed during the 1820s and, for many landlords, the Great Potato Famine, which began in 1846, became another reason to encourage or force emigration and depopulation. If there was a clash within the [Jacobites and Hanoverians who fought at Culloden] between a supposedly backward-looking Highland society and a 'progressive', capitalist Lowland economy, it was not a clear-cut one. Cameron of Lochiel, who fought for Charles, was as much a representative of a new capitalist attitude to Highland estate management as was the house of Argyll, ever the mainstay of support for the Hanoverian regime. Clan land had become the private property of individual landlords. Nevertheless, many of those landlords also struggled against harsh economic realities. "Much of the drama and tragedy of the Highlands is told in the negotiations between financially racked landlords and their creditors, agents and trustees... The best of intentions were never enough amid the more populous and improvement-driven world of the mid-century Highlands." Lynch suggests that there was also a "clearance of Highland landlords in the early nineteenth century" - those landlords who had not adapted to changing times and circumstances. As a result, control of the land passed to outsiders. The government gave financial aid for roads and bridges to assist the new sheep-based agriculture and trade. Another wave of mass emigration came in 1792, known to Gaelic-speaking Highlanders as the Bliadhna nan Caorach ("Year of the Sheep"). Landlords had been clearing land to establish sheep farming. In 1792 tenant farmers from Strathrusdale led a protest by driving more than 6,000 sheep off the land surrounding Ardross. This action, commonly referred to as the "Ross-shire Sheep Riot", was dealt with at the highest levels in the government; the Home Secretary Henry Dundas became involved. He had the Black Watch mobilised; it halted the drive and brought the ringleaders to trial. They were found guilty, but later escaped custody and disappeared. The people were relocated to poor crofts. Others were sent to small farms in coastal areas, where farming could not sustain the population, and they were expected to take up fishing as a new trade. In the village of Badbea in Caithness, the weather conditions were so harsh that, while the women worked, they had to tether their livestock and their children to rocks or posts to prevent them being blown over the cliffs. Other crofters were transported directly to emigration ships, bound for North America or Australia. The Reformation Parliament of 1560 made practising Roman Catholicism illegal, as well as the ownership of any property by a Roman Catholic. Catholicism was later identified with Jacobitism, and unacceptable in higher society. The number of adherents of Catholicism is difficult to estimate but it was a definite minority of the Scottish population, though a majority in some parts of the Western Highlands. In 1755 it was estimated that there were some 16,500 communicants, mainly in the north and west. In 1764, "the total Catholic population in Scotland would have been about 33,000 or 2.6% of the total population. Of these 23,000 were in the Highlands". Another estimate for 1764 is of 13,166 Catholics in the Highlands, perhaps a quarter of whom had emigrated by 1790. Dawson and Farber note that 'although the landlords did not target people for ethnic or religious reasons, the effect of the Clearances was to destroy much of the Gaelic culture, which was dispersed along with the people that fled.' and Protestants were the majority both of the Highland population generally and of those Cleared. Nevertheless, anti-Catholic sentiment (along with famine, poverty and rising rents) was a contributory factor in some Clearances. 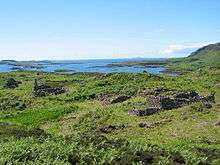 Ormaig was once the principal settlement on the Isle of Ulva near Mull. It had been inhabited since prehistoric times, until it was cleared by Francis William Clark in the mid-19th century. It was only in the early 19th century that the second, more brutal phase of the Clearances began. Most notorious are the examples of landlords trying to exploit changing economic circumstances to their financial advantage by clearing uneconomical tenants from their land, making room for more profitable uses such as sheep, deer forests or tourism. Two of the best documented such clearances are those from the land of the Duchess of Sutherland, carried out by her factor Patrick Sellar, and the Glencalvie clearances which were witnessed and documented by a London Times reporter. In 1807 Elizabeth Gordon, 19th Countess of Sutherland, touring her inheritance with her husband Lord Stafford (later Duke of Sutherland), wrote that "he is seized as much as I am with the rage of improvements, and we both turn our attention with the greatest of energy to turnips". As well as turning land over to sheep farming, Stafford planned to invest in creating a coal-pit, salt pans, brick and tile works and herring fisheries. That year his agents began the evictions, and 90 families were forced to leave their crops in the ground and move their cattle, furniture and timbers to the land they were offered 20 miles (32 km) away on the coast, living in the open until they had built themselves new houses. This plan has been described as a "typical example... of social engineering which met neither the hopes of the benefactors nor the needs of the beneficiaries, but produced social disaster." The Sutherlands' first Commissioner, William Young, arrived in 1809, and soon engaged Patrick Sellar as his factor, who pressed ahead with the process while acquiring sheep farming estates for himself. The Sutherlands were responsible for brutal clearances between 1811 and 1820. Sellar personally supervised the eviction of any who showed reluctance to go, and the burning of cleared houses (especially the roof timbers) to prevent re-occupation. Evictions of 2,000 families in one day were not uncommon. Many starved and froze to death where their homes had once been. The Duchess of Sutherland, on seeing the starving tenants on her husband's estate, remarked in a letter to a friend in England, "Scotch people are of happier constitution and do not fatten like the larger breed of animals." A dense cloud of smoke enveloped the whole country by day, and even extended far out to sea. At night an awfully grand but terrific scene presented itself — all the houses in an extensive district in flames at once. I myself ascended a height about eleven o'clock in the evening, and counted two hundred and fifty blazing houses, many of the owners of which I personally knew, but whose present condition — whether in or out of the flames — I could not tell. The conflagration lasted six days, till the whole of the dwellings were reduced to ashes or smoking ruins. During one of these days a boat actually lost her way in the dense smoke as she approached the shore, but at night was enabled to reach a landing-place by the lurid light of the flames. Portrait by Henry Raeburn of Alexander Ranaldson MacDonell of Glengarry in 1812. MacDonnell claimed to support Highland culture, while simultaneously clearing his tenants. Accounts like those of McLeod and General David Stewart of Garth brought widespread condemnation. Two old people evicted at Sellar's orders were too ill to go far. He left them exposed to the chill northern air and they died. He was acquitted on a charge of manslaughter, but the Duchess wrote: "The more I hear and see of Sellar the more I am convinced that he is not to be trusted more than he is at present. He is so exceedingly greedy and harsh with the people, there are very heavy complaints against him from Strathnaver." In due course Sellar was dismissed from his post. Elsewhere, the flamboyant Alexander Ranaldson MacDonell of Glengarry portrayed himself as the last genuine specimen of the true Highland chief while his tenants (almost all Catholic) were subjected to a relentless process of eviction. He abandoned his disbanded regiment; its Catholic chaplain (later bishop), Alexander Macdonell led the men and their families to settle in Glengarry County, eastern Ontario, Canada. The area was a major destination for Highland emigrants in the 18th century and early 19th century, and Gaelic was the native tongue of the settlement. In respect for their ancestors' Scottish culture, the county hosts the annual Glengarry Highland Games, one of the biggest Highland Games gatherings of its kind outside Scotland. A romanticised early Victorian depiction of a member of Clan MacAlister leaving Scotland for Canada, by R. R. McIan. As in Ireland, the potato crop failed in Scotland during the mid 19th century, and a widespread outbreak of cholera further weakened the Highland population. The ongoing clearance policy resulted in starvation, deaths, and a secondary clearance, when families either migrated voluntarily or were forcibly evicted. There were many deaths of children and the aged. As there were few alternatives, people emigrated, joined the army, or moved to growing urban centres such as Glasgow, Edinburgh, and Dundee in Lowland Scotland and Newcastle upon Tyne and Liverpool in the north of England. In places some people were given economic incentives to move, but in many instances landlords used violent methods. The inhabitants of these distressed districts have neither capital enough to cultivate the extent of the land necessary to maintain them if it could be provided, nor have they land enough were the capital supplied to them. Richards considers this observation to be "the central dilemma of the crofter economy". After the potato blight, there were more people than the land could support. The potato famine gave rise to the Highland and Island Emigration Society which sponsored around 5,000 emigrants to Australia from the affected areas of Scotland. With the development of pseudoscientific racist ideas from about 1850, the Clearances were at times supported by belief that the Celtic race was inferior to the Anglo Saxon race. George Combe's popular and influential The Constitution of Man, published in 1828, provided a framework which would be used by some to support theories of racial superiority. In 1850 Robert Knox published The Races of Men which asserted the inferiority of the Celt compared to the Anglo Saxon and Nordic races. The view that the economic failures of the Highlands were due to the shortcomings of the Celtic race was shared and expressed by the two most important Scottish newspapers, The Scotsman and the Glasgow Herald, together with the more northerly Inverness Courier. "Collective emigration is, therefore, the removal of a diseased and damaged part of our population. It is a relief to the rest of the population to be rid of this part." "A national effort" would now be necessary in order to rid the land of "the surviving Irish and Scotch Celts". The exodus would then allow for the settlement of a racially superior people of Teutonic stock. He welcomed "the prospects of flights of Germans settling here in increasing numbers – an orderly, moral, industrious and frugal people, less foreign to us than the Irish or Scotch Celt, a congenial element which will readily assimilate with our body politic." The Highland Land League eventually achieved land reform in the enactment of Crofting Acts, but these could not bring economic viability and came too late, at a time when the land was already suffering from depopulation. The Canadian Boat-Song expresses the desolation felt by those exiled from poor, but tight-knit communities with a longstanding, distinctive, and rich culture: "Yet still the blood is strong, the heart is Highland, And we in dreams behold the Hebrides." The diaspora was worldwide, but emigrants settled in close communities in Prince Edward Island, Nova Scotia (Antigonish and Pictou counties and later Cape Breton), the Glengarry and Kingston areas of Ontario and the Carolinas of the American colonies. Canadian Gaelic was widely spoken for some two centuries. One estimate for Cape Breton, Nova Scotia has 25,000 Gaelic-speaking Scots arriving as immigrants between 1775 and 1850. At the beginning of the 20th century, there were an estimated 100,000 Gaelic speakers in Cape Breton, but because of economic migration to English-speaking areas and the lack of Gaelic education in the Nova Scotian school system, the numbers of Gaelic speakers fell dramatically. By the beginning of the 21st century, the number of native Gaelic speakers had fallen to well below 1,000, though Highland surnames (and Roman Catholic confession) are still common in areas of Nova Scotia, such as in the town of Antigonish and the island of Cape Breton. Highland surnames are also widespread in Canada, the USA, Australia, and New Zealand. The clearances were an influential theme in Scots literature, with notable examples such as Consider the Lilies, a novel by Iain Crichton Smith. The emigrants statue commemorates the flight of Highlanders during the Clearances, but is also a testament to their accomplishments in the places they settled. Located at the foot of the Highland Mountains in Helmsdale, Scotland. On 23 July 2007, the Scottish First Minister Alex Salmond unveiled a 3-metre (10 ft) high bronze Exiles statue, by Gerald Laing, in Helmsdale, Sutherland, which commemorates the people who were cleared from the area by landowners and left their homeland to begin new lives overseas. The statue, which depicts a family leaving their home, stands at the mouth of the Strath of Kildonan and was funded by Dennis Macleod, a Scottish-Canadian mining millionaire who also attended the ceremony. An identical 3-metre (10 ft) high bronze Exiles statue has also been set up on the banks of the Red River in Winnipeg, Manitoba, Canada. ↑ Richards, Eric (2008). "Answers and Questions". The Highland Clearances: People, Landlords and Rural Turmoil. Edinburgh: Birlinn Ltd.
1 2 G. Dawson and S. Farber, Forcible Displacement Throughout the Ages: Towards an International Convention for the Prevention and Punishment of the Crime of Forcible Displacement (Martinus Nijhoff Publishers, 2012), ISBN 9004220542, p. 31. ↑ "Scotland's DNA: Tartan export". The Scotsman. 3 March 2011. Retrieved 22 May 2012. ↑ Houston, Robert, Allan Whyte, Ian D., Scottish Society, 1500-1800, Cambridge University Press, 2005, ISBN 0-521-89167-1, pp. 148-151. ↑ Richards, Eric (1982). A History of the Highland Clearances: Agrarian Transformation and the Evictions, 1746-1886. London: Croom Helm. p. 132. ISBN 085664496X. ↑ McKerracher, Mairead (2013). The Jacobite Dictionary. Neil Wilson Publishing. ↑ Lynch, Michael (1992). "Chapter 19, The Forty-Five and its aftermath". Scotland: A New History. London: Pimlico Ltd.
↑ Richards, Eric (2008). "Chapter 19, Section III - The landlords". The Highland Clearances: People, Landlords and Rural Turmoil. Edinburgh: Birlinn Ltd.
↑ Lynch, Michael (1992). "Chapter 21, The Highland Conditions". Scotland: A New History. London: Pimlico Ltd. p. 368. ↑ Campbell, James (1984). Invisible Country: A Journey through Scotland. Weidenfeld and Nicolson. p. 81. ISBN 0-297-78371-8. ↑ J. D. Mackie, B. Lenman and G. Parker, A History of Scotland (London: Penguin, 1991), ISBN 0140136495, pp. 298-9. ↑ Toomey, Kathleen (1991) Emigration from the Scottish Catholic bounds 1770-1810 and the role of the clergy, PhD thesis, University of Edinburgh, http://hdl.handle.net/1842/6795, Chapter 1. ↑ M. Lynch, Scotland, A New History (Pimlico: London, 1992), p. 367. ↑ Richards, Eric (2008). "Chapter 4, Section VI: Emigration". The Highland Clearances: People, Landlords and Rural Turmoil. Edinburgh: Birlinn Ltd. p. 81. ↑ "London Times of Tuesday, May 20, 1845". ↑ "London Times of Monday, June 2, 1845". ↑ "London Times of Thursday, October 22, 1846". ↑ "George Granville Leveson-Gower (1st Duke of Sutherland)". Gazetteer for Scotland. Retrieved 2008-02-01. ↑ Noble, Ross "The Cultural Impact of the Highland Clearances" BBC History. Retrieved 7 July 2008. ↑ Mcleod, Donald. "Gloomy Memories in the Highlands of Scotland". Retrieved 15 January 2016. ↑ Rea, J.E. (1974) Bishop Alexander MacDonell and The Politics of Upper Canada, Ontario Historical Society, Toronto pp. 2-7, 9-10. ↑ Richards, Eric (2008). "Chapter 18, Section VI - The Act". The Highland Clearances: People, Landlords and Rural Turmoil. Edinburgh: Birlinn Ltd.
1 2 Devine, Tom (2011). "Chapter 5, Human Selection and Enforced Exile, Section 2". To the Ends of the Earth: Scotland's Global Diaspora, 1750-2010. Smithsonian Books. ISBN 1588343170. ↑ MacNeil, Hector. "Our Living Celtic Culture". ↑ "Memorial statue marks clearances " BBC. Retrieved 5 October 2008. ↑ "Worldwide plan for Clearances memorials". The Scotsman. 2007-07-07. Retrieved 2008-10-05. The Highland Clearances. Article by Thomas Devine, published in Refresh 4, Spring 1987. McKenzie, Alexander, An Overview of the Clearances, 1881. Macleod, Donald, Gloomy Memories, 1857 (first-hand account of Sutherland clearances). McIntosh, Alastair, Soil and Soul: People versus Corporate Power, Aurum Press Ltd, 2004, ISBN 1-85410-802-6. Richards, Eric, The Highland Clearances, Birlinn Books, 2000. Grimble, Ian, The Strathnaver Trilogy, 3 vols: Chief of MacKay, The Trial of Patrick Sellar, and The World of Rob Donn. McLean, Marianne, The People of Glengarry. Highlanders in Transition, 1745-1820, McGill-Queen's University Press; 1993. Gebele, Hubert, Die Schottischen Clans im 18. Jahrhundert, Vom Wandel und Ende einer Hochlandgesellschaft am Rande Europas, A Personal Passion Play in Scottish History and Bibliography, Regensburg 2003. Hunter, James, The Making of the Crofting Community, John Donald Publishers Ltd; 2nd Revised edition (27 Jun 2000). Marx, Karl, Das Kapital, Charles H. Kerr & Company; 1906, Volume I, Part VIII, Chapter XXVII.